By Shondiin SilversmithHow far would you have to run to burn off the calories contained in 10 Chicken McNuggets? Answering that question earned a Tuba City student a first-place medal and computer tablet at the Navajo Nation Science Fair, where kindergarten through fourth-grade students from schools across the Navajo Nation came together to share their creative scientific minds at Red Rock State Park on Feb. 26. "I'm glad something like this is happening where our students are able to use their creativity to explore," said Leandra Thomas, Miss Navajo Nation. "There is so much to learn, and I'm impressed with all the little projects here." Over a hundred cardboard displays were set-up at the Red Rock Convention Center, and each of them contained a topic discussing different scientific matters related to eight science categories. Those categories included biology, chemistry, animal science, environmental science, physical science, computer science, engineering, and behavioral and social science. Some of the topics and questions presented by students included how to make a battery out of a few nickels and dimes, which liquid dissolves this food fastest, Is Big Foot real?, why kids are naughty or nice, making noise from a straw oboe, the science of paintball, and even a display on what part of a sheep people enjoy the most. Comment: For more on Navajo science, see Navajo Engineer Receives Presidential Award and Navajo Engineer Helped Develop Curiosity. 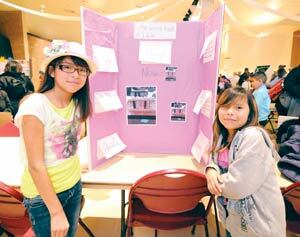 Below: "Fourth graders Mia Haceesa, left, and Makeesha Clah, at Dzil hna-o-dith-hle Grant School pose next to their 'Long Lasting Food in Liquid' booth Tuesday during the Navajo Nation Science Fair."